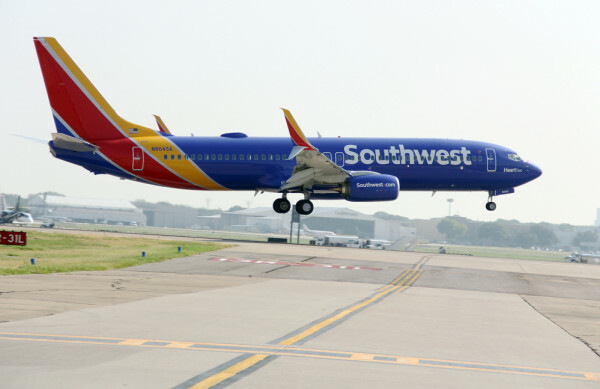 Southwest Airlines could start offering service to San José, Costa Rica, from Houston, Texas, as early as October 2015, according to a statement from the company on Thursday. San José is among six destinations for which the airline is seeking permission to serve in Latin America, along with four locations in Mexico and Belize. The Dallas-based airline filed applications with the U.S. Department of Transportation to offer daily, nonstop service from its new $156 million international concourse at William P. Hobby Airport in Houston to Cancun, Mexico City, Puerto Vallarta, and San José del Cabo/Los Cabos, as well as Belize and Costa Rica. The “Love” Airline already plans to offer service between Baltimore-Washington International Airport and Juan Santamaría International Airport starting in March 2015. “Service to Mexico will be the cornerstone of our international operation at Hobby and the four cities we are announcing today provide exciting travel and business options for consumers. Adding Belize to the Southwest network and growing our Costa Rica service continues our expansion to international destinations where our people and consumer-friendly policies can deliver as no other airline can,” said Gary Kelly, Southwest Airlines Chairman, President and CEO. The airline already offers flights to Aruba out of Houston and additional service elsewhere to the Dominican Republic, Mexico, Aruba, the Bahamas and Jamaica. 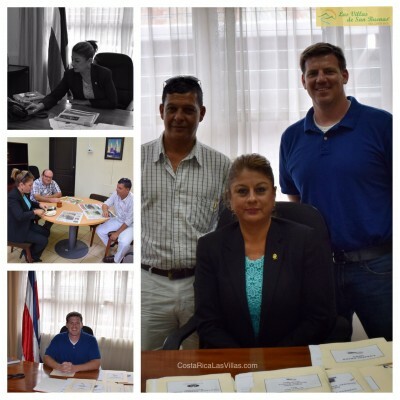 Las Villas de San Buenas Project Manager Hanz Cruz, and CEO Nick Halverson meet with Deputada Rosibel Ramos Madrigal at the Costa Rica Congress. visited the Legislative Assembly (Asamblea Legislativa), Costa Rica’s Congressional body. 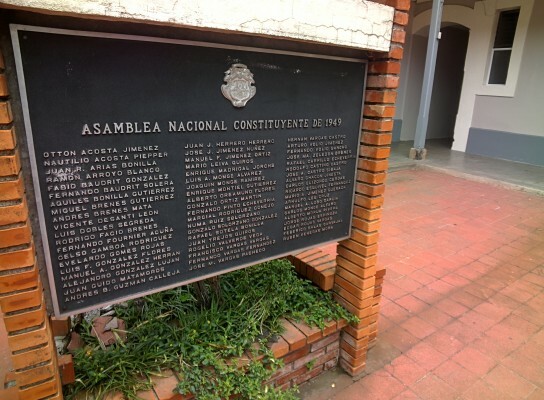 Costa Rica has an unicameral legislative structure (a single chamber. By way of comparison the USA has two – the House of Representatives and the Senate). A member of Congress is called a Deputado (Deputada if a woman) – which translates to ‘Senator’. Costa Rica has 57 Deputados, who are all elected every four years. Deputados do not have term limits, although they cannot serve consecutive terms. Once a Deputado’s four-year term expires, they must sit out an entire four-year election cycle before they can serve again. We spent approximately one hour talking with a couple of Deputados. We first met with Deputada Rosibel Madrigal, who represents the region including San Isidro del General/Perez Zeledon areas of San Jose province. Next we met with Gerardo Vargas Rojas who represents the province of Puntarenas. We discussed tourism, increasing foreign investment and I pushed to know more about the possible international airport in Osa (still being reviewed). with government officials to ensure they are aware of our project as well as we are kept abreast of any potential changes. We will continue to meet with officials quarterly. It was an enjoyable day and everyone we met with was friendly and hospitable. I’ll keep everyone updated on our future visits – and the Southern zone international airport. The Sunnyvale, California-based Motif is one of a growing cadre of foreign companies setting up shop in Costa Rica. Now with 185 employees, up from an initial 100 in late January, the company projects growing to 500 employees by 2012, said Andrea Centeno, communications director at the Costa Rican Investment Board (CINDE). This week marked the inauguration of Motif’s renovated 2,200-square-meter building in the America Free Zone in Heredia, north of San José. It joins Hewlett-Packard, StarTek and others at the facility near the Real Cariari shopping mall. Described on its website as “a business process outsourcing company serving Fortune 500 clients,” Motif’s Costa Rica office will provide telephone and e-mail services in both English and Spanish to clients of a prominent U.S. travel agency. Costa Rica excels at providing attractively priced, highly trained workers, a growing number of whom have enough mastery of English to provide customer services to U.S.-based businesses via phone and e-mail. While countries like Chile attract natural resource-oriented investment due to their mineral riches, and others attract foreign investment for access to their markets, Costa Rica’s competitive edge lies in its human capital, said Centeno. *Advanced manufacturing includes computer microprocessors, automotive parts, aeronautics and metal manufacturing. To facilitate travel for Nature Air passengers arriving at and departing from the Juan Santamaria International airport (SJO), Nature Air offers an affordable VIP Shuttle Service directly to and from the Nature Air terminal at the Tobias Bolaños International Airport (SYQ). For just $5 per person, passengers can make the ground connection between the two airports. One of our reps will meet and greet you at the airport and assist you with your luggage. All you have to do is sit back, relax and enjoy the friendly air-conditioned ride. This service can be arranged and paid for in advance when booking your Nature Air flight by filling out the form below or directly at either airport with the Shuttle Coordinator, located at the orange Taxis Unidos stand in Juan Santamaria Airport or with the Concierge desk at any of Nature Air’s airports. The shuttle departs three times per day from each location to accommodate most connections. For passengers arriving at Juan Santamaria, we recommend that you select an Airport Shuttle departure no sooner than one hour after your scheduled arrival. Please allow for no less than one hour before your Nature Air flight is scheduled to depart when taking the Airport Shuttle from Juan Santamaria. Passengers looking to connect from Tobias Bolaños to Juan Santamaria should book the Shuttle 30 minutes or more after their arrival to Tobias Bolaños and three hours prior to your departure from Juan Santamaria for your international flight. The Tobias Bolaños International airport is located just 5 minutes from downtown San Jose, and approximately 20 minutes from the Juan Santamaria airport. Nature Air chose Tobias Bolaños as its main hub to best accommodate the airline’s average 74 daily departures and arrivals to and from San Jose. As the main air service provider at Tobias Bolaños, Nature Air also avoids the frequent delays you typically find at the Juan Santamaria Airport. Our passengers do not have to deal with long security lines and traffic at other airports, and our facilities include a restaurant and other services for the comfort of our passengers. Additionally, our convenient proximity to downtown San Jose allows us to better serve local clients.